On the bright side, there was still a chance to visit the temples. After 5 pm each day, you can purchase a One-day pass for the next day and still be admitted into the archaeological park that same day. 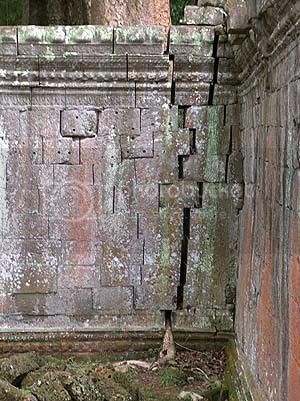 * So I managed to And so it was with this happy entrance feature that we were introduced to our first temple, Ta Prohm. Ta Prohm is an excellent introduction to the temples of Angkor because of its seeming state of disrepair – under French colonial rule, the restoration and conservation of Angkor was left under the direction of the Ã‰cole franÃ§aise d’ExtrÃªme-Orient (The French School of the Far East, or EFEO). The EFEO decided to leave Ta Prohm in its state of disrepair in order to show how the many temples looked in their overgrown state. The result is a deliberate facade of neglect. Strangler figs and silk-cotton trees have taken root in much of the superstructure, often sprouting from the tops of walls while the roots edge down to the ground, often splitting the building below. In essence, the tree and the building become inseparable – in some instances, it is the tree that holds up the building. Ta Prohm’s overgrown state gives it an air of romantic, even ethereal, stillness. Needless to say, Ta Prohm has a lot of photographic appeal. The temple itself was built during the reign of King Jayavarman VII (c. 1125-1215) and an associated inscription no longer at the site states that it was founded** in 1186. Ta Prohm was built to bring merit to King Jayavarman VII’s mother. In addition to that, the temple’s main deity Prajnaparamita, or the personification of wisdom, was modelled after the king’s mother. 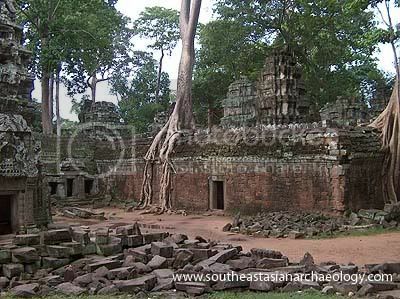 To the northeast, a nearby temple, now known as Preah Khan was built to commemorate Jayavarman VII’s father. 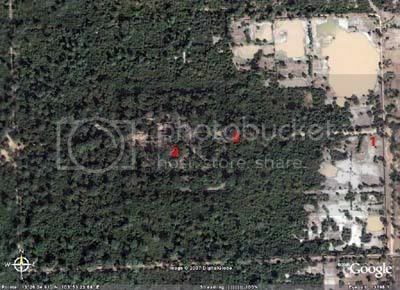 Thankfully, Google Earth has some pretty good pictures of the plan of Angkor. Most Angkor temples are housed in a rectangular complex oriented in along an East-West axis. Entry into the complex is usually through a gopura (gateway) on the east side. 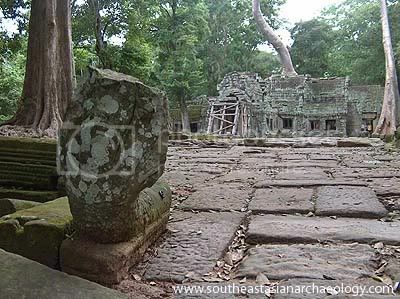 Ta Prohm is no exception here, and the entrance is marked (1). The temple itself, the crumbling remains that you see here are at (2), while the terrace where the headless naga (snake) was taken is approximately at (3). As you can see, the rectangular boundary of the complex is still visible from the air. It is in this area, inside the wall and now overgrown by jungle, that the population would have lived. In popular culture, Ta Prohm captured the imagination of moviegoers as some parts of the Angelina Jolie*** film Tomb Raider was filmed here – and indeed, this is another reason why Ta Prohm draws in the crowds. The carefully maintained facade of timelessness may certainly have boosted its popularity, but the trees that take root in the superstructure of this former monastery continue to grow – and continue to be a problem. My guide pointed out this section of wall where the root had pushed the stone blocks apart by two inches. The year before, the gap was only hairline! It will only be a matter of time before the wall comes crashing down – and with that reveals the concern from my Cambodian guide: he questions this state of enforced neglect and wishes that Ta Prohm be conserved and restored fully, as much as the other temples in the area. Exploration in Ta Prohm took approximately an hour, and in an case it was time to go because the archaeological park closes at 6 pm every day. Up next: Angkor Wat! ** Unlike modern foundation stones, the date of foundation described in the inscriptions commemorate when the temple was “consecrated” – likely to be to time the sacred statue was installed in the temple rather than when the temple first began construction. *** I write her name with some irony – the Angkor temples have been remembered for a good thousand years; I’m not sure if the same can be said for Ms. Jolie, such is the fleeting nature of fame.